The workshop was aimed at assisting WCO Members of the Europe region with the implementation of the Framework of Standards on Cross-Border E-Commerce to build capacities for addressing the challenges presented by growing cross-border E-Commerce. In his opening speech, Mr. Csaba Torda, the Head of Hungarian Customs Department welcomed all participants and thanked the WCO and the CCF Korea for organizing this timely event on a very thematic topic of E-Commerce, for addressing associated challenges being faced by Customs administrations. Mr. Seunghwan Jeong from Korea Customs Service shared his thoughts from a donor perspective on the relevance of the topic of Cross-border E-commerce, underlining the importance of capacity building in this area. 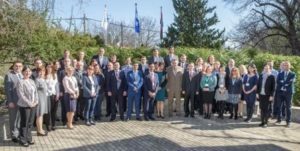 The workshop brought together more than 50 participants coming from 26 Member Customs administrations of the Europe region and the private sector. The WCO experts, supported by an expert from the European Commission, explained the Customs perspective on the Cross-border E-commerce and presented the different business models, global and regional trends and the key drivers/ requirements for its development. Industry experts shared business perspectives, elaborating potential opportunities for enhancing collaboration between Customs and E-Commerce stakeholders, as well as successful projects such as the establishment of a pre-arrival processing system in some countries of the region. After outlining the opportunities and challenges presented by the cross-border E-commerce for Customs administrations in the region, experts introduced the WCO Framework of Standards on Cross-Border E-Commerce and explained each of the Standards contained therein. The underlying intent and expectations stemming from various standards were discussed with a view to implementing the Framework in a harmonized and expeditious manner. The Experts elucidated different aspects of the Framework such as advance electronic data, risk management, and expedited shipments, and presented relevant WCO tools such as the Immediate Release Guidelines. Additionally, the workshop discussed several cross-cutting issues concerning security and safety and illicit trade in the E-Commerce environment, as well as cooperation mechanisms between Customs and postal operators with regard to establishing interconnectivity of Customs and postal IT systems and the exchange of electronic advance data for an effective risk management. In this context, related regulatory developments such as the EU’s Union Customs Code (UCC) and the US STOP Act, and related requirements were noted. Furthermore, the participants gained deeper insight into different models of revenue collection on E-commerce shipments and associated issues such as valuation, classification and rules of origin. Members’ initiatives (e.g., Australia and the EU) and new regulations were provided. There was also a wide-ranging discussion on de minimis regimes that varied from one Member to another. Throughout the workshop, several Members shared their implementation experiences and initiatives/pilots within the context of various standards of the Framework under four broad themes: trade facilitation and simplification; risk management and control measures for curbing criminal exploitation of E-Commerce including safety and security threats; postal issues, and revenue collection. The presentations made by participants contributed to enhancing the understanding of practical aspects of the Framework of standards. The participants also had an opportunity to observe postal-Customs clearance process at the office of exchange of Hungarian Post. Going forward, the WCO will continue supporting Members in this area, based on their specific needs and requirements.